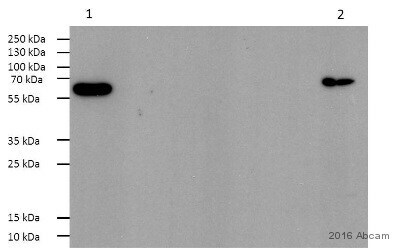 Rabbit polyclonal RIP3 antibody. Validated in WB, IP, IHC and tested in Mouse, Human. Cited in 23 publication(s). Independently reviewed in 26 review(s). Immunogen corresponding to synthetic peptide. 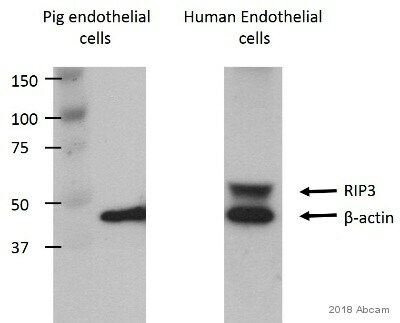 Synthetic peptide corresponding to Human RIP3 aa 168-217. Immunogen is located within the provided sequence. 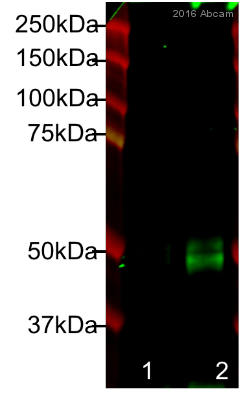 Jurkat cell lysate (Western blot). 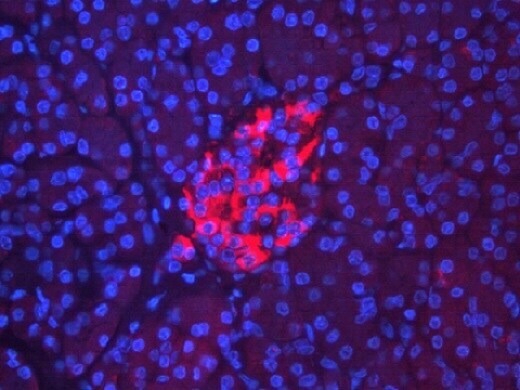 Human pancreas (IHC-P). Our Abpromise guarantee covers the use of ab56164 in the following tested applications. WB Use a concentration of 1.25 µg/ml. 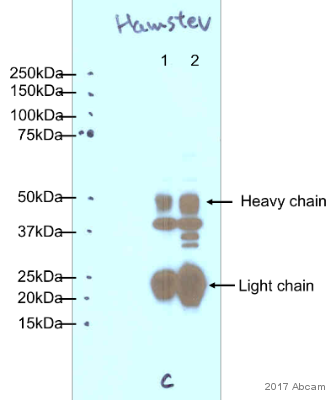 Detects a band of approximately 57 kDa (predicted molecular weight: 57 kDa). Good results were obtained when blocked with 5% non-fat dry milk in 0.05% PBS-T.
IHC-P Use a concentration of 3 - 12 µg/ml. Immunohistochemical analysis of Formalin/PFA-fixed paraffin-embedded human pancreas sections labelling RIP3 with ab56164 at 3 - 12 µg/mL. 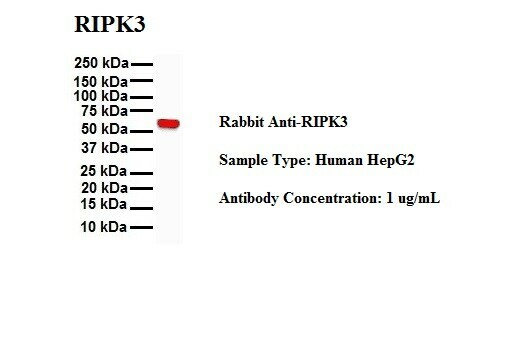 The secondary antibody used was a donkey anti-rabbit antibody at 1/200. The exposure time was 0.2 seconds at magnification of 20X. 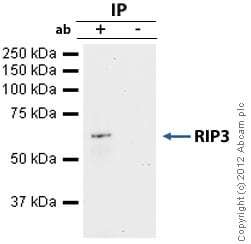 RIP3 was immunoprecipitated using 0.5mg Jurkat whole cell extract, 5µg of Rabbit polyclonal to RIP3 and 50µl of protein G magnetic beads (+). No antibody was added to the control (-). 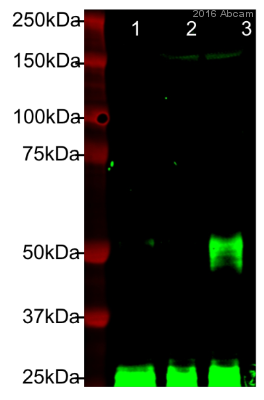 Proteins were eluted by addition of 40µl SDS loading buffer and incubated for 10min at 70oC; 10µl of each sample was separated on a SDS PAGE gel, transferred to a nitrocellulose membrane, blocked with 5% BSA and probed with ab56164. Publishing research using ab56164? Please let us know so that we can cite the reference in this datasheet.